There are lots of great cars out there but few that outperform their price tag. The Mazda3 is one in the economy category. The Chevy Corvette is nearly as thrilling as the Porsche 911, for many thousands less. And now, filling in some of the middle ground, comes Audi's new A3, a brash, five-door dart-about with Audi's signature luxury touches, starting at well under 30 grand. The A3, to some purists, represents a risky trend: the bastardization of the purebreds. Audi, like BMW and some other performance nameplates, is reaching slightly down-market in search of younger customers it can bring to the family early. Thus the palatable base price of about $25,500. Judging by the product, though, I'd say Audi sure isn't slumming it. The A3 comes with a 200-horsepower turbocharged four-cylinder engine, the same one found in the A4 sedan. The standard transmission is a manual short-throw six-speed, precise and fun. A combination of brisk acceleration, pugnacious handling, and a sporty, stylish cockpit makes this one of the most enjoyable rides under $40,000. It feels like a sports car, but the A3 also offers the kind of versatility sought by 20-somethings with just one car or by young families carting toddlers around. The hatchback design lets you fold down the back seat and squeeze in a bicycle or surfboard or the makings of a home improvement project. I managed to cram an entire disassembled futon into the A3, an impressive hauling job for a so-called compact car. For all its practicality, the A3 manages a touch of class. Dashboard controls are illuminated with the same red backlighting that gives Audi's loftier vehicles the aura of a walnut-paneled private library. As if all this weren't enough, the A3 is thrifty on gas too, averaging better than 25 miles per gallon in overall driving. Fuel efficiency usually gets overlooked on performance cars. But this time around, Audi seems to have missed very little. Nits: There's no auto-headlamp setting. You have to turn 'em on and off yourself. G forces: The A3 isn't the fastest or tightest-handling car on the market, but it is probably the sportiest hatchback you'll find anywhere. The 200-horsepower turbocharged engine yields nothing to a V-8 and makes the A3 seem light as a scooter. On curves, the A3 is so confident that you wish you were churning circle after circle. Gizmology: Audi didn't cut corners on interior appointments or electronics. A dual-zone climate system is standard. So are auto up-down switches on all four windows. Controls have a solid feel of quality, better than usual in this price range. Kidmarks: Another happy surprise: the A3's family friendliness. The car sits fairly low, making it easy for kids to climb in and out or for parents to strap in a car seat. The back seat is more spacious than usual for a compact, there are overhead reading lights, and a center armrest contains two cupholders and a small activity tray. There's not a lot of storage space, though, except for the rear cargo area. Hot or not: Hot. 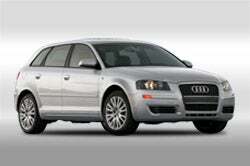 The high hatchback creates a boxy look, but the A3 looks foreign, distinctive, and fresh. Envirometer: Not yet rated by the EPA for auto emissions or pollution. Mileage ranges from 24 mpg/city to 32 mpg/highway. Crash course: Not yet crash tested by the government or by private testing organizations.